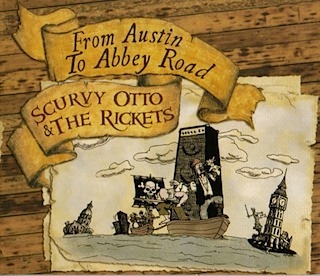 During the Summer of 2008, Scurvy Otto and The Rickets recorded their first CD - "From Austin To Abbey Road". The history of the event is available at the South Texas Stomp Web site along with photos on Flickr and videos on YouTube. There are song previews, lyrics, and notes are available on the A2AR Session Notes site. Also, if you would like to purchase the album, you can order the CD from CD Baby or download the tunes from iTunes, Napster, Rhapsody, and Amazon.